USS Hugh W. Hadley (DD 774) completion photo, outer harbor, San Pedro, California, 11 December 1944. 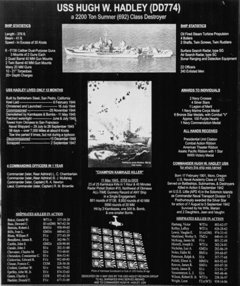 The champion kamikaze killer, holder of the all-time individual ship single-engagement anti-aircraft gunnery record—20 planes splashed plus three destroyed by hitting the ship in 100 minutes—was destroyer USS Hugh W. Hadley (DD 774). Built at Bethlehem Steel’s San Pedro, California yard, the Hadley (as her crew knew her—there was no other ship named Hadley) commissioned 25 November 1944, the 52nd of 70 2,200-ton Allen M. Sumner-class destroyers. She was named for Commander Hugh William Hadley, commanding officer of Transport Division 12, whose flagship, high-speed transport Little was lost with sister Gregory at Guadalcanal, 5 September 1942. After shakedown, Hadley was attached to Destroyer Squadron 66 and in her short 167-day operational career earned one battle star plus a Presidential Unit Citation for her performance at Okinawa. There on 11 May 1945, she was on Radar Picket Station 15 with Fletcher-class destroyer Evans and five “pall-bearers.” Although more than one hundred planes attacked the two destroyers and both were hit, both crews managed to save their ships, which were eventually towed to the West Coast but never repaired.